I finally got my Pebble! Pebble is a “smart watch” launched by the most successful Kickstarter Campaign to date. I was one of the first backers, so have been looking forward to playing with this thing for over a year. I had to wait even longer than some people because I’m a fan of color and chose the red version. Most people chose black (yawn), so I had to wait until all the black watches were made shipped until they got around to the color ones. Late last week my patience was rewarded and my watch finally showed up! It came in a nice, compact box with the watch, rubber watch band, and the custom charging cable. It reminded me of the efficient packaging Amazon uses on their Kindles. Simple, clean, and effective. I had it up and working in about a minute. Why use a smart watch? 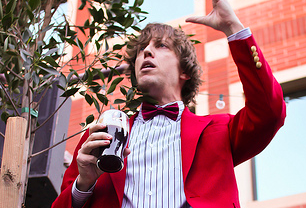 Google Glass gets a lot of press, but I really have no interest in it. I have no desire to document every second of my day, and I don’t need to constantly be connected online. 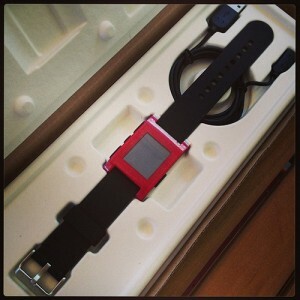 I simply want seamless, easy access to the information and tools I have, which is why Pebble appealed to me. Pebble is a nice looking watch that connects to my iPhone via Bluetooth and acts as a convienient extra screen and mini-remote control from my phone. Nice and simple. Check out the Pebble Kickstarter video for more details. If my phone is in my pocket or bag and I get a call, the caller-id shows up on my Pebble and I can press a button to answer or ignore the call. If I get a text message I can look at Pebble to read it. I can control my iTunes app and change my music if my phone is out of reach. Those are just the basic features so far. The people who make the watch have created an software developer’s kit (SDK) that will let developers write their own apps to take advantage of the watch. Pebble also lets you load custom watch faces onto the display, which is a minor but fun feature. 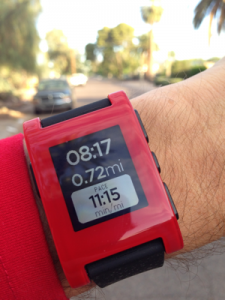 There is already a website full of custom Pebble faces you can add to your phone. I’m hoping that sort of community creation starts hitting apps soon and gives me all sorts of things to tinker with. One of the first third-party apps to support Pebble is the popular RunKeeper fitness app. I already use RunKeeper for tracking my cardio, so even though my back was a little sore I decided to take it out for a run and see how the new integration worked. The RunKeeper app saw my Pebble, which lit up with my run time, distance, and current pace. Since this was the first major app to support Pebble I was prepared for a little tinkering to get it to work, but was happy to find it worked seamlessly. The display on my wrist was much handier than trying to see the screen in the armband, or use the voice over status. I think it will be even more useful when I get back to regular runs and want to check my pace over different intervals. My only gripe is that it doesn’t allow me to change the song that’s playing while running, which is a shame. Fortunately I’ve already cultivated a few good playlists for running that don’t need much editing. Right now it is a fun toy, but without a lot of apps out there yet it is hard to say if it is a game changer. If I had to bet, I would say that Pebble will likely become a handy convenience in a lot of small areas rather than a killer must-have accessory. Lots of other companies are rumored to be looking into smart watches after seeing how red-hot the Pebble Kickstarter became. Unless you love being an early adopter or like toys, I’d say wait until the Fall and see which apps are available for the Pebble and which other smart watches hit the market.